We tried two varieties: egg, ham & cheese, and sausage, egg & cheese. I stood by - taking notes - as one of the girls prepared the wraps. Kellie: Very bachelor friendly packaging. No plate. No tools. You just throw 'em in. You're microwave can be dirty. It doesn't matter because you cook them in the package they come in. After a couple minutes, the cooking was complete and we began our taste test of the sausage variety. Mr Breakfast: Strange that they don't call them burritos. That's what they look like. Laura: Tasty... in a creepy manufactured kind of way. Kellie: I don't like the consistency. Mr Breakfast: What do you mean? Kellie: It's like cheesy-gooey and fatty-sausage-gooey all mixed together. Laura: But it is tasty. Kellie: I'm not a big fan of this one. Laura: But you don't like sausage though. Kellie: Shut up. I do too. You always say that. Mr Breakfast: What about the egg in this one? Does it feel like real egg? Laura: It seems a little more real than in the other thing (Jimmy Dean's Muffin Sandwich). Kellie: The egg is good. It also has a McDonald's cheese quality too it. 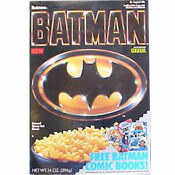 Laura: Seems like many pre-prepared breakfast foods have a weird after-taste. Mr Breakfast: And that's what you're getting now? Kellie: But the wrap part... the actual tortilla thing... is done really well. It's not mushy and it's not hard. At this point, we began to sample the bacon variety. Laura: Boy, this looks gross. Kellie: The consistency of the ham is not the cube consistency that you see on the box. Laura: It's super salty. Doesn't taste like ham really... just salt. Kellie: Tastes like deviled ham. Laura: The egg in this one doesn't seem the same as it does in the sausage one. Mr Breakfast: It's more like powdered military eggs. Laura: I don't like it. It's so different. I'm throwing it away. Mr Breakfast would like to thank Kellie Dancho and Laura Martin of Los Angeles for their help with this product review. The Golden Egg score for this product is an average of 6 Golden Eggs for the sausage variety and 2 Golden Eggs for the ham variety. 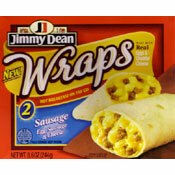 What do you think of Jimmy Dean Wraps? Love this product and I just discovered them a few weeks ago and now I can't find it in any of my local grocery stores.... sniff sniff. Best breakfast burrito I've had that I didn't make myself. My husband and I are truck drivers and we eat a lot of meals in the truck since we have a microwave and refrigerator with a little freezer. We have found the "New" Jimmy Dean breakfast wraps are the best ever, 300% improvement over the old ones. We have only had the sausage, we don't like ham. I am having a problem finding them now though, and that is a BIG problem for us. The ones I had were not in microwavable material. napkins then melded with the wraps making most of it uneatable. Even cooking at lower temp and shorter time produced same reult.